So, what made you decide to go to Alabama? : the question that I have been asked a thousand times (if not more). My canned answer was, “Well, I wanted a very traditional college experience with a big football team and greek life.” On the surface, it was true. But underneath, what I really craved a different and new experience that would incite growth. In short, moving to Alabama for college was unsurprisingly one of the most challenging experiences I’ve faced so far in life. I moved away from my friends, family, and high school boyfriend to be 2,000 miles away in a place that was so different it felt like I should have needed a passport. I moved to a state where I knew a total of two people who lived an hour away, where the political climate/accent/weather was the complete opposite to where I grew up, and to top it all off, where I had spent a total of 48 hours in my life. There were huge roadblocks and learning curves. Aside from a racism scandal within sororities and the general culture shock, I also dealt with huge doubts of whether or not I was capable of actually getting through the degree and dealing with all these struggles for another three years. I came out of my first year planning to complete my prerequisites to transfer to a school in the University of California (UC) system and get the heck out of there as fast as I could. 18 year-old me couldn’t think of a way I would possibly be able to deal with the loneliness, sense of general directionless movement, and homesickness for any more time. I gave myself one semester – one semester to decide if I liked it enough to stay. That semester turned into a found best friend and fulfillment in school and extracurricular activities, which turned into a year of a break up and a falling out with a roommate and uncertainty about where my life was headed. I grew more than I ever knew was possible. I learned how to deal with people who I didn’t agree with, especially who I didn’t agree with politically, which can be an incredibly heated and passionate conversation that requires a lot of patience and empathy in nearly all cases. I learned how to make my own plans and manage my time without someone that would spend all their free moments with me. I learned how strong I was – and how much I loved exploring new places. I learned how much I learned that I really love the freedom of having a car (and the fact that I didn’t have one in Alabama sucked). I learned how those who persevere are capable of great things. Staying in the Bay Area never would have given me the same knowledge and experience that I got from moving cross country. Alabama ended up being absolutely perfect for me. Without it, I never would have found my passion for marketing, graphic design, or digital media. The unique experience that I had at Alabama directly lead me to my career. Those opportunities wouldn’t have happened at another school. I wouldn’t have my purpose, my passion, or my degree without Alabama. I wouldn’t have those things without a decision that I fully regretted for over a year. 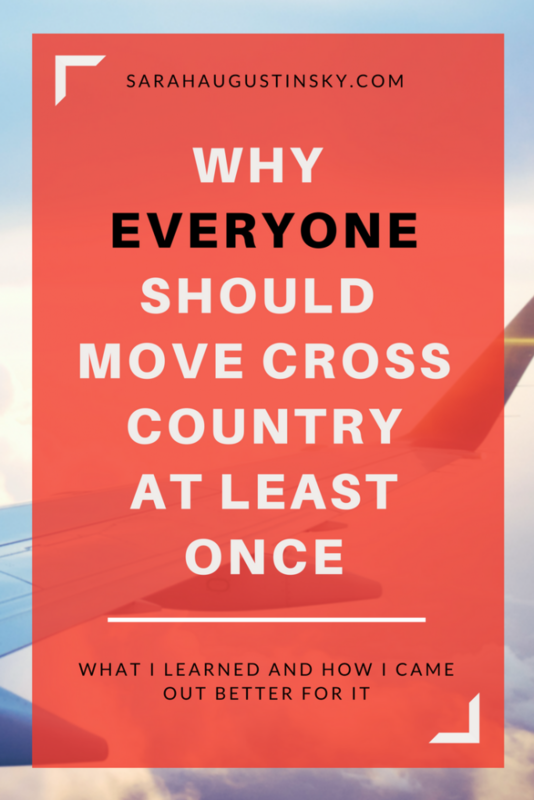 Why should everyone move cross country at least once? To challenge themselves, to push to new places they wouldn’t go otherwise, to grow into themselves, to get outside the box and outside the ever-so-comfortable zone we stay in. Want to learn about the world? Move. Want to learn about yourself? Move alone! Hey! Are you ready to up your business and start blogging more? Get your FREE blog post checklist below! It’s a 30 point checklist that will cover ALL your blogging bases and help grow your tribe.